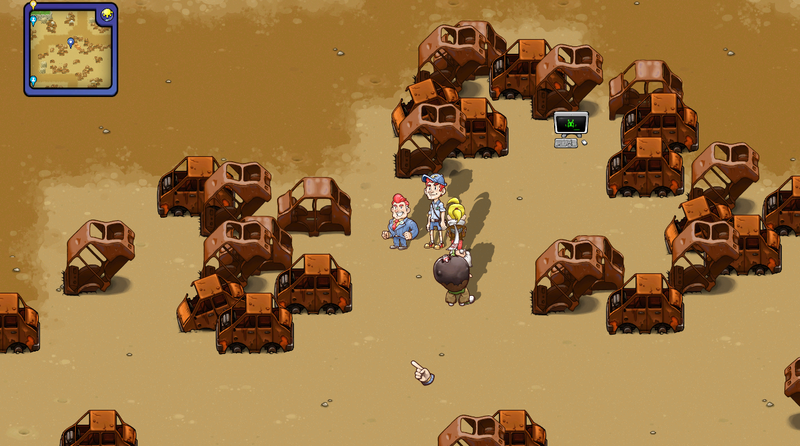 The Junkyard is a side area you’ll most likely come across during Chapter III, if you decide to help the Programmer with the Radar Database quest. You can find it via the northeastern exit of Big Steppe, north of Crystal Beach. The trip here is dangerous for lower-level characters, so you may want to have your party around level 20 or more before taking a walk. Despite the name and the surroundings Junkyard is itself an entirely inoffensive area, with no enemy encounters and not a ton of necessary exploration. It should only take a few minutes to wander around the whole area and see all there is to see. - Follow the road east until you reach beachside bluffs that force you south. There’s another treasure box hidden the branch of a tree on the eastern-most bluffs. It contains a Muffin. - To the south you’ll wind up heading into the junky part of Junkyard. Just before you hit the dirt, walk north along the grass, following the fence that surrounds the central pit. There’s a Stimulant overlooking the northern edge of the pit. - Despite being the primary draw of the Junkyard, the pit full of rusted cars is fairly boring. You won’t find much down here besides a bunch of idling NPCs. The primary exception is around the midpoint of the pit, where you can find a computer that’s penned in by several heavy rocks. Only the Bodybuilder can get you through. The computer will allow you to enter Virtual Reality, use the VR Arena, and, if you have the Programmer in your party, access the Radar Database you need for the quest of the same name. - All done, more or less. The only other thing to see here is in the southwest corner of the map, where you’ll find another rock for the Bodybuilder. Hurling it out of the way will allow you to access Flushmoor.